On the occasion of Diwali when everyone will be celebrating the festival with much grandeur and fervor. Do not miss out a chance to convey your heartwarming Diwali wishes to your loved ones in the sweetest way from a wide assortment of sweets like rasgulla, gulab jamun, kaju katli, barfi etc. From FlowerAura. Diwali is one of the most special festivals which is celebrated by Indians all over the world. This special and grand festival symbolizes the victory of good over evil or dark. Also known as Laksmi puja, Deepavali or Diwali Puja, this auspicious festival is a celebration of hope and light. Diwali brings a chain of other festivals like Deepdan, Dhanteras, Govardhan Puja, Bhai Dooj etc. It is one such festival that eliminates all the cultural, regional or religious barriers and everyone shares the equal fun of this festival. As we know the fact that sweets have always been the crucial part of any kind of occasion and Diwali is also not an exception to it. When it comes to celebrating the occasion of Diwali, sweets are just inevitable. Those days are long gone when you have to visit local sweet shops to buy sweets of your choice and send it your beloved one by yourself as now you can simply order Diwali sweets online and your order will be delivered at given address mentioned in India. All you can do it from the comfort of your home. Now you might be wondering how. Well, FlowerAura is the answer. 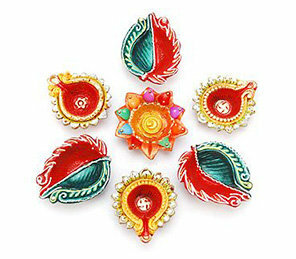 FlowerAura, the online gift store has always been a highly popular name in the market of Diwali sweets. The popular and authentic Indian Diwali sweets offered by this store are Rasgullas, Gulab Jamuns, Soan Papdi, Motichoor Laddoos, Kaju Katlis, gourmet chocolates such as handmade Diwali chocolates, Ferrero Rocher or Cadbury temptations. You can also order Diwali sweet boxes online and hampers for your beloved one in Diwali. Most of the people prefer to do Diwali sweets online shopping from FlowerAura only and the smart delivery service offered by this online gift store is the reason behind it. When it comes to having a very prompt Diwali sweet online delivery service in India, FlowerAura actually takes pride in best in class delivery service. The entire process of ordering online Diwali sweets and savories is very simple so that anyone can do it. All you have to do is go to the official store of FlowerAura, select your favorite Diwali sweet hampers, mention the specific address and make the payment. You are simply done as this online store will send the Deepavali sweets online to your address. You can also check the Haldiram Diwali sweets price list so that you can order the most delicious sweets for your close people. For all your loved ones who live miles apart from you, now you can send Diwali special sweets online across India with FlowerAura. Yes, if you cannot go in person to wish your loved ones a very happy Diwali then, you can surely send happy Diwali sweets via FlowerAura’s same-day delivery services. FlowerAura offers a delicious range of traditional Diwali sweets prepared with the finest quality of ingredients that your loved ones will surely love to savor. With FlowerAura’s prompt delivery services, you don’t have to worry about the timely delivery of Diwali snacks and sweets. In fact, now, you can avail our midnight delivery and send a fresh Diwali cake or Diwali sweets online in India right at the midnight. So, go ahead to send Diwali sweets online for your loved ones from FlowerAura to enjoy a hassle-free delivery service. Why Choose FlowerAura To Order Diwali sweets Online In India? We, at FlowerAura, offer you all a mouthwatering range of sweets for Diwali festival. You can find a wide variety of the best Diwali sweets available here. Apart from just unique Diwali sweets, FlowerAura also offers unique Diwali handmade gifts like chocolates, jellies, cookies etc. We have Diwali sweet boxes online that can complement every kind of bond. Whether you are looking Diwali sweet packs for your parents or friends, our range of Diwali sweets is perfect for every relation. To buy Diwali sweets online in India, you can completely count on flowerAura as it provides express delivery services. You can avail both today and next-day delivery with FlowerAura and enjoy free shipping benefits. Placing Diwali sweets order online is extremely easy and hassle-free with FlowerAura. All you need to do is to visit our website Floweraura.com, choose the Diwali sweet box or hamper, you want for your loved ones, add your address details, and make the payment comfortably seated at your home. So, if you want to experience a hassle-free Diwali shopping experience, hurry up to place your Diwali sweets order with us. Remember, you can enjoy all these above-mentioned perks with us which we bet, you won’t get anywhere else. Have a happy and safe Diwali!